Stetind as seen from Halls foretop. Photo: Johnny Haglund. Stetind, the exposed ridge from the foretop to summit. Photo: Nordland Adventures. Very Hard. 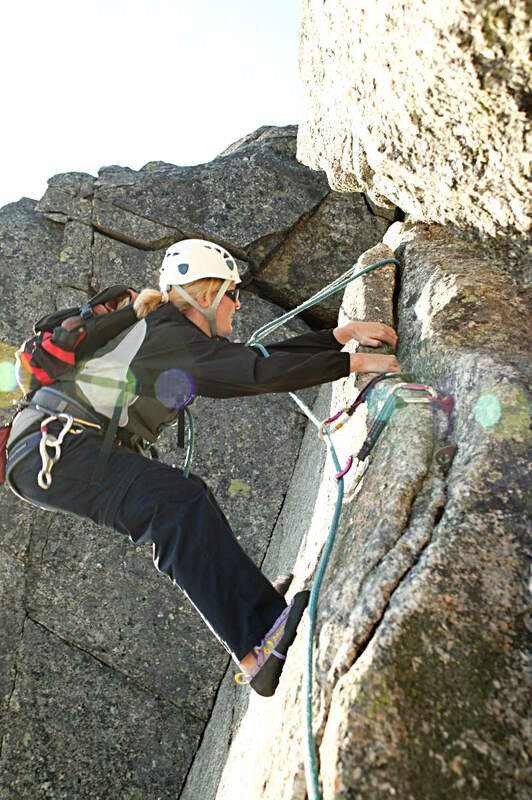 Climbing Stetind is a strenuous trip which includes climbing. Please see details below. 10 - 12 hours from meeting point. One guide can handle 3 (4) people. Is this trip for me? Stetind is a hard and demanding trip. 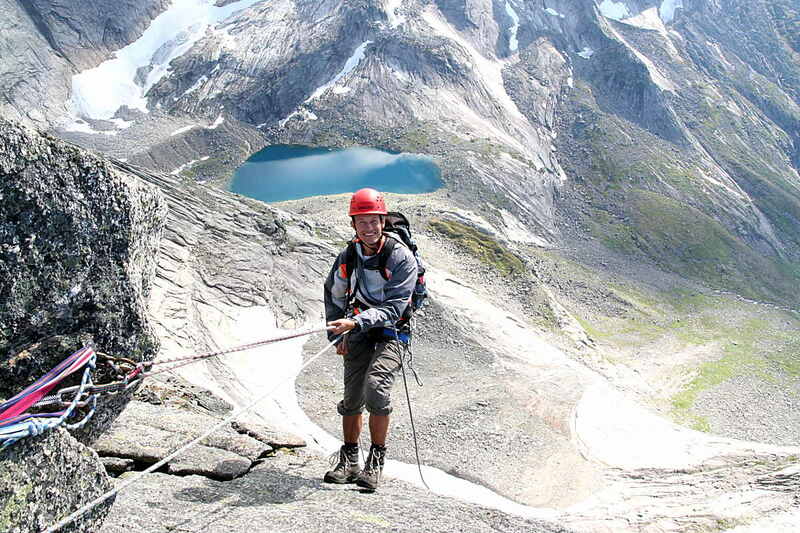 This trip is designed for people in very good physical condition, with previous alpine experience, and a good head for heights. You will benefit from previous climbing experiences, but this is not absolutely required. 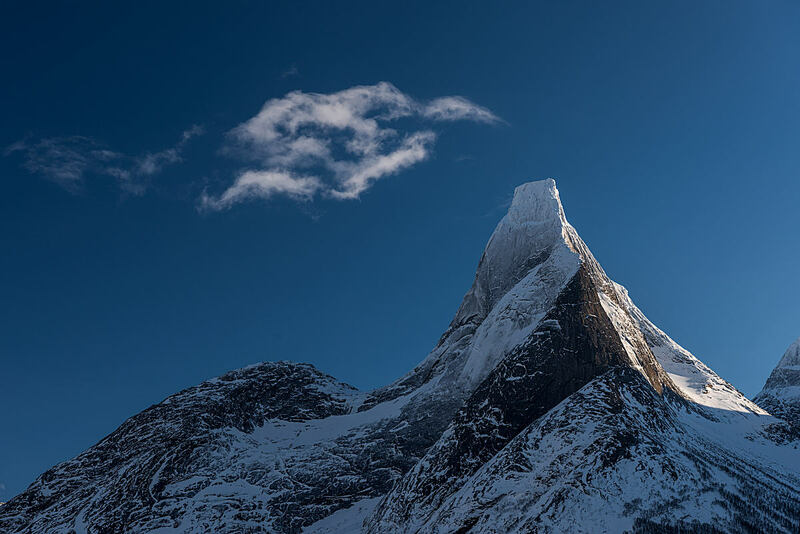 The tour involves steep uphill walking for 3 – 4 hours only to reach the Halls foretop. The walk down might be the toughest part for the legs and knees. We do recommend using walking poles. Grading: this trip is graded as Very Hard. Minimum age: reccomended minimum age is 16 years. Stetind via normal route: Our guided tour to Stetind follows the `normal route` which is the easiest way up. The tour to starts with a good trail through a wonderful birch forest. At 700 m above the sea, terrain gets rougher, filled with boulders and sparcely vegetation. From the foretop we will traverse the exposed ridge to the top of Stetind. Halls foretop: When reaching the foretop we will take a rest. The guide will give you a safety talk and an introduction to the gear that we will use. Here we will also be exposed to the 750m ridge of serious exposure above 800m granite slabs just a few degrees off vertical, on both sides. 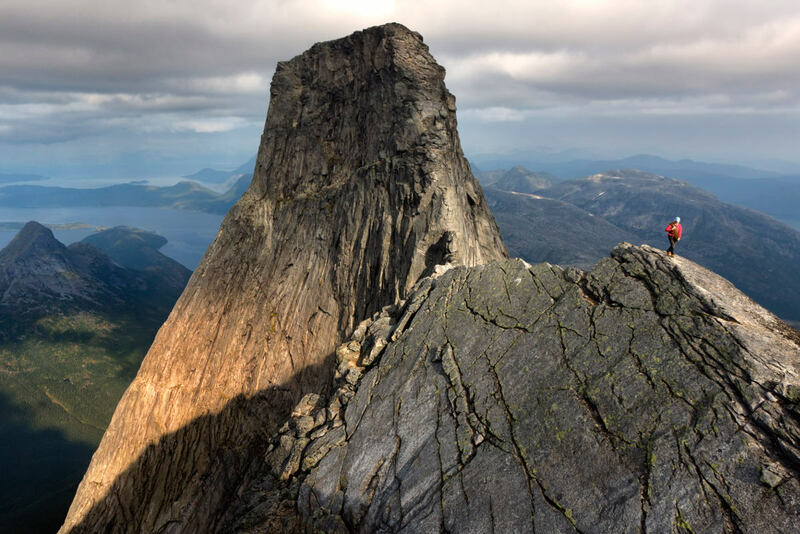 Mysosten block is the crux of the route. The main crux of the route is the epic “finger traverse”. It is barely three or four metres in length but quite difficult. The technique is to “hand traverse” a crack in a ledge that rises diagonally. If you need help here we will do everything necessary to make you do it. None of our clients have failed here, but it has been some blood and tears. The return: Going back Mysosten block requires an abseil on the return route. If you have not done abseiling before, this is a scary place to start! 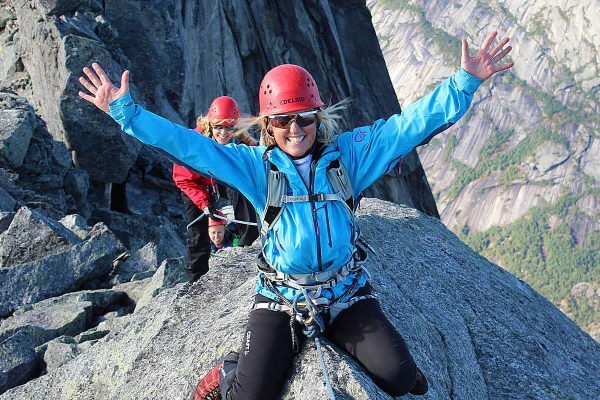 Only 30m of abseiling, above an 800m slope of pure granite. We are controlling your moves also here, and trust the ropes, they can hold a load of 3000 kgs. Enjoy! For a more detailed route-description, check out westcoastpeaks.com. Bring your own hiking boots. Personal clothing: be prepared for wind and rain (snow). Gloves and a varm cap. Day pack (min 30 l). Snacks for a long day. Water will be found on our way up to 700 m a.s.l. An experienced, knowledgeable, english speaking guide. Meeting point is by Stetind Hotel. Please see map above. Time for meeting: Evening before your planned trip. Make sure to be at the hotel early evening. Where is Stetind? 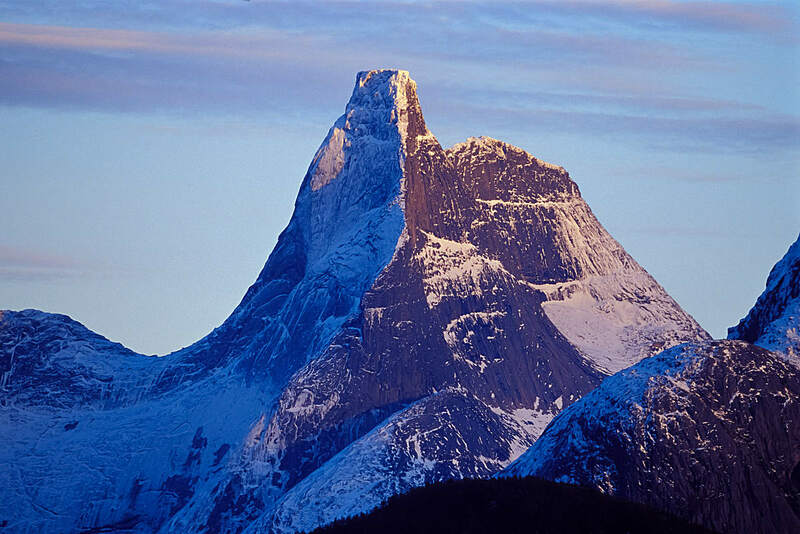 Stetind is located in Tysfjord in Northern Norway, beetween the cities of Bodo and Narvik. How to get to Stetind? Transport is not included in the price. Feel free to ask if you need help to figure out how to get to Stetind. Rental car is recommended. Public transport: Going by bus needs proper planning. Getting to Kjøpsvik by bus from Bodø or Narvik might be an option. If you plan to go there on your own: check timetable for bus Bodø – Narvik. Ferries: for ferry-boats across the fjord (Tysfjord) check timetable from Drag to Kjøpsvik or Bognes to Skarberget. A guided tour to Stetind is not reccomended in wet conditions. Climbing is easier on dry rock, and more important: to enjoy the outrageous view from the top. Where to stay near Stetind? You need to stay one night near Stetind before the climb. We recommend Stetind Hotell in Kjøpsvik. Are You Ready to Climb Stetind?